This model is the "Action" series, and the pump is mounted inside the structure of the unit as an "All in one". For the type with the pump mounted inside the boat, see the Standard series Benefits for action : Easier rigging, does not take up room inside dry well, 1 year warranty on pump Benefits for standard : Less weight on transom, 5 year warranty on pump. For outboard owners without factory tilt and trim, Bob's Machine Shop has a solution. 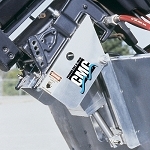 Designed for motors up to 40 hp, BMS's new hydraulic Tilt & Trim can provide increased performance, better handling and less hassle raising and lowering the motor at the launch ramp. 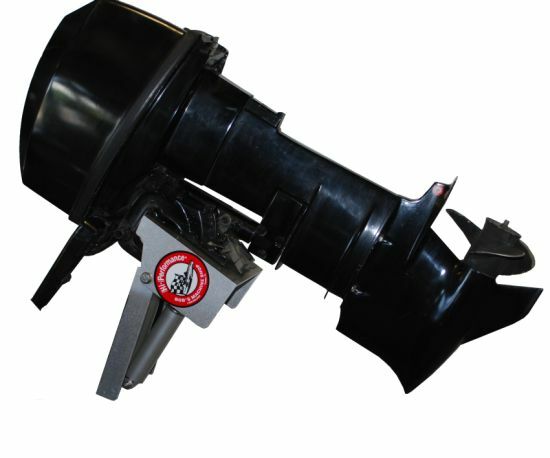 Bobs Machine Shop Clamp-on motor tilt and trim (Action Series) 40HP The Tilt & Trim allows skippers to trim the boat for a smoother, drier ride. When fully trimmed in, it provides a negative 3-degree tuck-under angle for faster starts and quicker on-plane times. After reaching plane, the boat can be optimized for best running angle by trimming the tilt up to its maximum of 75 degrees. A 5-1/2 inch setback is standard. The hydraulically operated Tilt & Trim will accommodate clamp-on motors, not standard BIA bolt pattern style. Call for questions. The Overall mounting dimensions, which are: 11.5" wide by 10" length BMS's Tilt & Trim is easy to install. It comes with wiring harness, control switch and carries a limited lifetime structural warranty.